The bike store we shipped the bikes to called and said that the bikes arrived safely! We just have to get to Manchester, NH and put them together now. Here we go: New England for the Fall Colors! OK! We have tickets and this trip is going to happen! We fly to Manchester, New Hampshire this coming Wednesday, and start riding on Thursday. We'll be posting our adventures and pictures as we go and get a chance. We're starting to keep closer and closer track of our budget, because we want to make a realistic budget for the big trip (from the Arctic Circle to the bottom of South America) which we hope to start next year (in 2006!). So here's our budget for this one. We'll see how we do. We're figuring about $20/day/person. That will come out to about $400/person (not including airfare or shipping the bikes both ways). Hopefully we can do it! We got our bikes all put together today and got on the road. 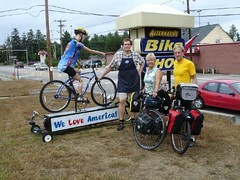 The wonderful folks at Alternative Bike helped us get all set and gave us an idea where to go. Our first little loop before family reunion on Saturday is to ride up and over toward the coast and back down toward Exeter. We're riding this afternoon in a light rain, sometimes heavier, and just working our way north. We rode our bikes along the entire coast of New Hampshire, yes the whole coast before noon on Saturday. Are you impressed? Well it was only 16 miles of coast line but it was so beautiful. Riding along the sea coast was such a treat. Moist area, surfers out in the rocklined shallows and eel grass marshes. We rode to my cousin Janice's house in Stratham, NH where all my crazy troy relatives mingled for the the Troy Family Reunion, an afternoon of eating, drinking and general fun. Aunt Kay was the oldest at 96. (Fiesty old broad) It was wonderful seeing all the relatives I have not seen in ages. We rode our bikes this morning from Stratham to Exeter to visit Randy's uncle and aunt. We rode 41 miles up to Dover where our new friend Roland walked up to us out of the blue at the grocery store and took us home for dinner. Wonderful evening with top notch people (and new friends). Wow. What a treat!